Atezolizumab (Tecentriq) shows promise as primary therapy in patients with cisplatin-ineligible, locally advanced metastatic urothelial (bladder) cancer, according to data from the IMvigor210 study presented at the 2016 American Society of Clinical Oncology annual meeting. Preliminary results also showed encouraging overall survival data, said Arjun V. Balar, MD, Co-Leader of the Genitourinary Cancers Program, Perlmutter Cancer Center, New York University Langone Medical Center, New York, NY, who presented the results. “I think these data make a compelling argument for atezolizumab to be a potential new standard of care in patients with cisplatin-ineligible metastatic urothelial cancer. Moreover, it could represent the beginning of a seismic shift in our treatment approach for all patients with metastatic disease, irrespective of their eligibility for cisplatin,” Dr Balar said. Atezolizumab was approved in May 2016 for the treatment of patients with locally advanced or metastatic urothelial cancer that progressed during or after platinum-containing chemotherapy. Cisplatin-based chemotherapy is currently the standard of care in the first-line setting, but many patients with metastatic bladder cancer are ineligible for cisplatin therapy because of a poor performance status or an impaired renal function; therefore, these patients receive non–cisplatin-based regimens or best supportive care, according to Dr Balar. However, response durations are short with these regimens. Atezolizumab is a humanized monoclonal antibody that selectively targets PD ligand 1 (PD-L1). By inhibiting its interactions with PD-1 and B7.1 receptors, “it can reinvigorate exhausted T-cells and unleash antitumor immunity,” Dr Balar said. Cohort 1 of the IMvigor210 study included 119 cisplatin-ineligible, chemotherapy-naïve patients (median age, 73 years) with metastatic disease. 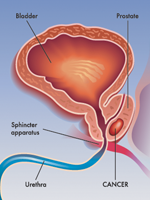 The bladder (or urethra) was the primary tumor site in 71% of the patients, and 66% had metastatic disease at visceral sites. Renal impairment was the most common contraindication to cisplatin. Atezolizumab 1200 mg was given intravenously every 3 weeks until disease progression. At the time of data cutoff in March 2016, 98 patients discontinued treatment, with disease progression being the most common (75 patients) reason. At a median duration follow-up of 14.4 months, the objective response rate was 24%, and 7% of the patients achieved a complete response. Similar responses were observed when response rates were stratified by PD-L1 expression. In the subgroup of patients whose tumors underexpressed PD-L1, the overall response rate was 21% and the complete response rate was 8%. “Across the board, we see complete responses in all IC [immune-cell] subgroups. Activity of this level in this patient population is unprecedented,” said Dr Balar. “Responses were rapid, at a median time of 2.1 months,…and they are durable,” he added. The median duration of response was not yet reached in any PD-L1 subgroup, and 75% of the responses are ongoing. Tumor regression was observed across all immune-cell subgroups. The estimated median overall survival for the entire study population was 14.8 months, and the estimated 12-month survival rate was 57%. Atezolizumab was generally well-tolerated–only 6% of patients discontinued treatment because of an adverse event. Treatment-related all-grade and grade 3 or 4 adverse events occurred in 66% and 15% of patients, respectively. One patient died from sepsis.